Obituary – Bowles, Marjorie (Laird) « Perry High School Alumni Association, Inc.
Glee Club, Honorary Society, Girls Reserve, Red Hots, Operetta. Former Perry resident Marjorie Laird Bowles, 81, died Saturday, Jan. 16, 1993, at her home at Stillwater. Funeral will be at 2 p.m. Tuesday at the First Presbyterian church of Perry. Burial will be at Grace Hill cemetery at Perry under direction of Strode Funeral home of Stillwater. The casket will be open only prior to the service. 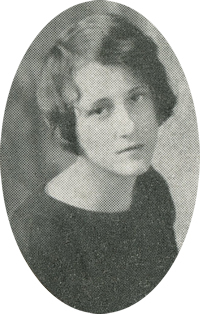 Mrs. Bowles was born at Perry, March 10, 1911, the daughter of Samuel Elmer and May Belle (Shinn) Laird. She and Edward Shrader Bowles were married on Sept. 17, 1934, in the Presbyterian manse in Perry. At age 55, Mrs. Bowles began studies at Oklahoma State university. She obtained a degree in psychology with a minor in chemistry in 1970. Mrs. Bowles was an OSU biochemistry technician for several years and later was employed as a social worker in Tulsa until she retired. Mrs. Bowles also was an artist who specialized in portraits. Mrs. Bowles was preceded in death by her husband on May 9, 1986; an infant son, three sisters, LeOla Donley, Helen Boone and Kathryn McQuiston; and two brothers, Carl laird and Paul Laird. Survivors include three sons, James E. Bowles, Los Angeles, Calif., John C. Bowles, Atlanta, Ga., and Joseph S. Bowles, Rocky Mount, N.C.; three daughters, Ann Henry, Tulsa, and Jean Bowles and Jan Hempfling, both of Stillwater; 13 grandchildren and two great-grandchildren.